The new pictures of Pluto and its moon Charon from the New Horizons' fly-by have been a vast improvement on the previous look at the dwarf planet. Now, with such hi-res images, NASA scientists have a detailed look at the geological features of both celestial bodies. These features need naming, and while Pluto has it's sahre nerdy namesakes cough Cthulhu Regio cough, Charon is really where the geeky planetary scientists let their freak flags fly. Here's a breakdown of all the Geek references NASA scientists chose in naming the various chasms and mountains of Charon. Take a look at NASA's map of Charon. Already, some iconic names are jumping out at you. That's because almost every feature on Charon's surface has been named after some facet of science fiction pop-culture. The largest being the Mordor Macula, a gigantic dark spot on Charon's surface named after the evil region of Middle Earth controlled by Sauron in The Lord of the Rings. Let's break down the rest. In the top left of the map, you'll see three craters. These are named after the star-crossed Jedi family, upon which, the Star Wars franchise centers. The first is Skywalker Crater, they family's surname. The second and third are named Organa, for Leia's adoptive family, and Vader, the Sith pseudonym of Anakin Skywalker. Vader Crater is, fittingly enough, much darker than the other two. Ripley Crater, named for Sigourney Weaver's iconic character, Ellen Ripley from the Alien franchise is located directly on top of Nostromo Chasma, which is named after the ship that first carried her and the original xenomorph. Let's hope nothing like this exists in our galaxy. Just below Nostromo is another Chasma whose namesake is another iconic science fiction vessel, TARDIS Chasma. Named for The Doctor's space ship and time machine, this Chasma runs through the Gallifrey Macula, a dark area named for the home planet of the Time Lords, The Doctor's long lost race. On either side of the Gallifrey Macula are the Nasreddin Crater, named for the Sufi satirist, and Alice Crater, named after the title character from Lewis Carroll's Alice in Wonderland series. Macross Chasma is named after the popular mech anime, Macross. Beginning in 1982, the popular anime depicts "a love triangle against the backdrop of great battles" says creator Shoji Kawamori. It takes place in the first great Human/Alien war. It's fitting that one of the larger areas is named for the classic sci-fi tv/movie franchise, Star Trek. 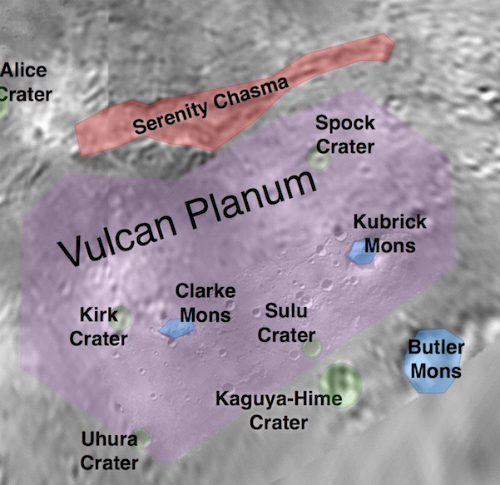 The Vulcan Planum, a large plateau on Charon, is named after the logical species that co-founded the Federation of Planets with Humans in the classic 1960's series. Peppered around this plateau are four craters each named for a different member of the first Enterprise: Kirk, Uhura, Sulu, and Spock. This is the first time something in space will be named after Star Trek, except for the Martian Roddenberry Crater, named after the franchise creator. 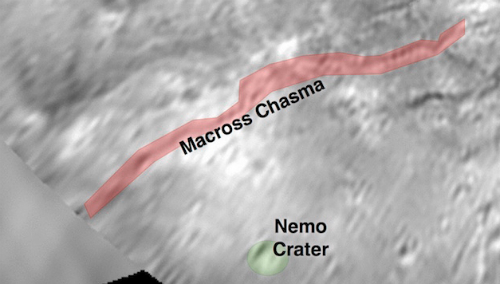 The Vulcan Planum is also directly below Serenity Chasma, the most recent reference on Charon. It, of course, is named for the ship from Joss Whedon's tragically canceled space/cowboy epic, Firefly. The Vulcan Planum has some other features. Three raised areas called Mons (kind of like the Mons pubis). Each of these is named after a great figure in science fiction. The IAU tends to favor names that have been around for a while, but 'Star Trek' is almost 50 years old now and 'Star Wars' is about 40 years old." Re-Framed: Perhaps We Could Share a Pizza?